SHREVEPORT, LA — Celebrated Southern writer John T. Edge, who profiled iconic local restaurants in a recent episode of the television show TrueSouth, will return to Shreveport in May to deliver the commencement address to Centenary College’s Class of 2019. Edge will also receive an honorary Doctor of Humane Letters from the College during the commencement exercises in the Gold Dome on Saturday, May 4. Edge created TrueSouth for the SEC Network/ESPN along with executive producer Wright Thompson and hosted the first season of four episodes that premiered in September 2018. The Shreveport-Bossier episode, the fourth in the inaugural season, aired on October 9, 2018 and highlighted local arts and culture alongside two beloved local eateries, Herby-K’s and Lucky Palace Chinese Restaurant. The series explores the intersection of food and Southern culture as a vehicle for telling honest stories about the past, present, and future of the region. Edge has built a career examining and celebrating the relationship between food and culture in the American South. He has written or edited more than a dozen books, including the critically acclaimed 2017 volume The Potlikker Papers: A Food History of the Modern South, named a book of the year by NPR, Publisher’s Weekly, and others. He is a contributing editor at Garden & Gun magazine, a columnist for the Oxford American, and for three years wrote the monthly “United Tastes” column for the New York Times. Edge has won three James Beard Foundation awards, including the 2012 M.F.K. Fisher Distinguished Writing Award. 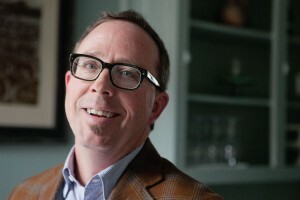 Edge is also director of the Southern Foodways Alliance at the University of Mississippi, an organization that has completed more than 900 oral histories and 100 films documenting the diverse food cultures of the American South. The organization also stages three yearly symposia and publishes a journal and podcast, “Gravy.” Edge edits the SFA’s series Studies in Culture, People, and Place published by the University of Georgia Press. The 2019 commencement exercises at Centenary begin at 10:30 a.m. and are free and open to the public. More information, including a live stream link that will be available on the day of the ceremony, is available at centenary.edu/graduation.